The Essen Seminar for Algebraic Geometry and Arithmetic consists of the research groups in the area of algebraic geometry, algebraic K-theory, arithmetic geometry and number theory at the University Duisburg-Essen in Essen. Prof. Marc Levine was awarded an ERC Advanced grant within the Horizon 2020 program of the European Union. In this project, he will develop and investigate refined methods of enumerative geometry, where the results of counting problems are given by a quadratic form rather than a natural number. This yields valuable additional information and a clearer geometric picture of such problems over non-algebraically closed base fields such as the real numbers. Further information. As of April 1, 2019, Dr. Jasmin Matz from Hebrew University at Jerusalem has joined the Faculty of Mathematics of the University of Duisburg-Essen as a junior professor. Her area of research is analytic number theory, for instance she works on automorphic representations and the Arthur-Selberg trace formula, topics which have close connections with several of the research groups here. At the Essen Seminar for Algebraic Geometry and Arithmetic, we are very happy for this reinforcement of our team, and heartily welcome her. The summer school Motives and Stacks will take place in Essen from 23rd till 27th of September. Victoria Hoskins, Paul Arne Østvær and David Rydh will give mini-courses. In March 2019, we will host a Workshop on Prismatic Cohomology (after Bhatt and Scholze), in the style of the Oberwolfach Arbeitsgemeinschaft (i.e., the participants apply for giving a talk, in order to learn about the topic). From September 17 to 21, 2018, a Summer School in Arithmetic Geometry will be held in Essen. Fabrizio Andreatta, Ana Caraiani (to be confirmed) and Eugen Hellmann will give mini-courses and there will be a series of research talks. The conference Vector Bundles on Algebraic Curves 2017 will take place in Essen from 4th till 8th of September. Emanuele Macri and Gonçalo Tabuada will give mini-courses and there will be a series of research talks. Starting April 1, and May 1, 2017, respectively, Andre Chatzistamatiou and Andreas Nickel join our group with a Heisenberg grant of the German Research Foundation DFG. We are glad that the chose the Essen Seminar as their work place welcome them heartily. A Winter School on Higgs Bundles and Fundamental Groups of Algebraic Varieties will take place in Essen from 27th till 30th of September with mini-courses by Bruno Klingler and Adrian Langer and several research talks. SFB/TR 45 will continue until June 2019. The Transregio-Sonderforschungsbereich (Collaborative Research Center) 45 “Periods, Moduli and Arithmetic of Algebraic Varieties of the German Research Foundation (DFG) will be funded for 4 more years. Press release of the Universität Duisburg-Essen (in German). A Spring School on $p$-adic Arithmetic will take place in Essen from 23rd till 27th of March with mini-courses by Gabriel Dospinescu, Laurent Fargues, Eike Lau and several research talks. Special Semester in motivic homotopy theory. The Research group Levine is holding a special semester in motivic homotopy theory during the Summer semester 2014, with the financial support of the Alexander von Humboldt Foundation. In addition to the residence of numerous guest researchers during the semester, several lecture series and a Workshop in motivic homotopy groups of spheres form part of the program. For further information about the activities planned for the special semester as well as a list of the researchers in residence, please see the website. SPP in Homotopy theory and algebraic geometry. In its March 2014 meeting, the Senate of the DFG approved the establishment of a Special Programm in homotopy theory and algebraic geometry. Coordinator of this Programm is Prof. Dr. Marc Levine; additional Initiators are Prof. Dr. Hélène Esnault (FU Berlin), Prof. Dr. Birgit Richter (Univ. Hamburg) und Prof. Dr. Stefan Schwede (Univ. Bonn). The main goal of the Programm is to stimulate the interactions between the areas of homotopy theory and algebraic geometry via projects in research areas such as motivic homotopy theory, derived algebraic geometry as related to ring spectra, equivariant homotopy theory, differential homotopy theory and the application of ideas and methods of homotopy theory to algebraic geometry. A number of conferences and workshops on these topics are planned. The Essen seminar has joined the ALGANT consortium. The consortium offers a two-year world-class integrated master course and a joint doctorate program in pure mathematics, with a strong emphasis on Algebra, Geometry and Number Theory. Both programs have received the Erasmus Mundus label. Conference on Arithmetic Algebraic Geometry. 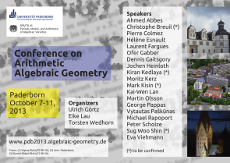 In October 2013 a conference on arithmetic algebraic geometry will take place in Paderborn. Among other sources, it is financially supported by the SFB/TR 45. Organizers: U. Görtz, E. Lau (Paderborn), T. Wedhorn (Paderborn). Workshop: Riemann-Roch for Deligne-Mumford stacks. The traditional workshop Essen-Paderborn will take place on January 19+20 in Essen. We will study a version of the Riemann-Roch theorem for Deligne-Mumford stacks, due to Edidin, Graham and others. We welcome the new post-docs, PhD students and guests, who joined the Essen Seminar for Algebraic Geometry and Arithmetic this semester: Federico Binda (Univ. Milan), Jin Cao (Chinese Academy of Sciences, Beijing), Viet-Cuong Do (Nancy), Jean Fasel (LMU München), Christian Haesemeyer (UCLA), Yong Hu (Univ Paris-Sud 11), Shane Kelly (Univ. Paris 13), Kelvin Liu (Michigan State Univ. ), Oleg Podkopaev (Norwestern Univ. ), Shu Sasaki (King’s College London), Haifeng Wu (Capital Normal Univ. Beijing). Hélène Esnault has accepted a chair at the Freie Universität Berlin starting October 1st, 2012, taking up the first Einstein-professorship of the FU Berlin. For over twenty years Hélène Esnault, together with her husband Eckart Viehweg, has significantly contributed to the development of mathematics in Essen, especially in the field of algebraic geometry. In 2003 Hélène Esnault and Eckart Viehweg received the Leibniz Award of the German Science Foundation, giving further impetus to their formation of a large and active research group whose influence has been felt far beyond Essen, and establishing the foundation for the present Essen Seminar for Algebraic Geometry and Arithmetic. We wish Hélène Esnault all the best for her future in Berlin and for our part hope that a solid connection with Essen will remain. The succession for the Chair Esnault is expected be announced in the course of the coming weeks. 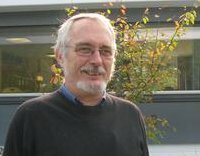 Eckart Viehweg was university professor for mathematics in Essen from 1984 through 2010, initially at the Gesamthochschule Essen, and after the fusion Essen/Duisburg at the University of Duisburg-Essen. During this time – and from 1990 on together with Hélène Esnault – he was dedicated to the advancement of algebraic geometry in Essen, and played a significant part in the development of the faculty of mathematics. His scientific achievements were honoured by numerous awards and distinctions. He was invited speaker at the International Congress of Mathematicians in Berkeley in 1986. In the year 2009 he was elected to the Deutsche Akademie der Naturforscher Leopoldina. In the same year he was awarded honorary doctorate of the Vietnam Academy of Science and Technology in Hanoi. The Leibniz Award of the German Science Foundation which he received together with his wife, Hélène Esnault, in 2003 made it possible to greatly expand the activities of the research team. With this and other subsequent projects Essen grew to be a highly active site for algebraic geometry, with numerous connections to the worldwide mathematical community. It is these personal contacts – to mathematicians in leading nations such as the US and France as well as to those in scientifically less developed countries – that were always of great importance to Eckart Viehweg. On February 2, Prof. Dr. Jochen Heinloth and Prof. Dr. Vytautas Paskunas held their inaugural lectures at the mathematics department of the University of Duisburg-Essen. On the occasion of Marc Levine’s 60th birthday from June 11 to 13, 2012, an international Conference on Cycles, Motives and Homotopy Theory will take place in Essen. Organizers: H. Esnault, V. Srinivas. Dr. Jochen Heinloth (University of Amsterdam) and Dr. Vytautas Paskunas (University of Bielefeld) have accepted offers from the University of Duisburg Essen and will join the Faculty for Mathematics and the Essen Seminar as of the coming winter term. Welcome to Essen! Prof. Dr. Gabor Wiese has accepted an offer from the University of Luxemburg and will start his new position in September. We regret that he will leave Essen, thank him for the work he did here and for his high level commitment, and wish him all the best for his new position. Dr. Moritz Kerz has accepted an offer from the University of Regensburg and will leave the University of Duisburg-Essen at the end of the summer term. We congratulate him on this success and wish him all the best for his new position. Deutsche Forschungsgemeinschaft has approved the continuation of the Transregio-Sonderforschungsbereich (Collaborative Research Center) 45, Moduli spaces, periods and arithmetic of algebraic varieties (Mainz/Bonn/Essen). We are looking forward to the research opportunities this will make possible during the next four years. Dr. Moritz Kerz will be awarded a Heinz-Maier-Leibnitz prize 2011 of the German Research Foundation DFG. Press release of the DFG (German). Press release of the University of Duisburg-Essen (German). Prof. Hélène Esnault was awarded a research chair of excellence “Chaire d’Excellence” 2011 of the Fondation Sciences mathématiques de Paris . The University Duisburg-Essen has announced a W3 professorship for algebraic geometry (Nachfolge Eckart Viehweg) and a W3 professorship for arithmetic geometry (Nachfolge Gebhard Böckle). Both research groups will be part of the Essen Seminar. Update: In the meantime, offers have been made to two candidates, and the negotiations are being prepared. Prof. Dr. Adrian Langer from Warsaw University will be awarded the Friedrich Wilhelm Bessel prize of the Alexander-von-Humboldt foundation, in recognition of his research results in algebraic geometry. He will use the prize money for another stay at the Essen Seminar. Press release of the university . On September 24th the Essen Seminar of Algebraic Geometry and Arithmetic participated in the University’s Night of the Sciences, an event of Ruhr2010. “Impressions:”/fotos/ . Prof. Dr. Gabor Wiese has been awarded the Gottschalk-Diederich-Baedeker prize 2010 of the University Duisburg-Essen. The prize is awarded annually to young scientists for outstanding work in the science or engineering at the University Duisburg-Essen and carries a prize money of 5000 €. Press release of the university. With more than 170 participants from all over the world the Conference on algebraic geometry and arithmetic in February 2010 was a great success. Press release of the university.